All we mostly knew was that at some point the Big Dark had signaled the end of the world, or was it the beginning, I was even confused as to that. I would read about another place and time, and ask the Master where this fit into reality. What year was it, and what direction was it to these places? 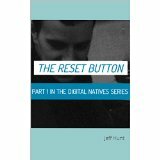 This is the first part of a bleak dystopian journal by Jeff Hunt. America after the power went out and a weird cultist called Lee has decreed that all children should be culled at the age of two. At least I think that is what happened. I am not totally sure. Certainly we are in a post-literate world without any modern comforts. A world were myth creation and superstitions rule and no one, but very few, have any knowledge at all. Chaos reigns and this is the story of Royal, a saved child (who was privileged to learn to read at the foot of the Master with Olympia (a girl in a world where where don't seem to be any others) both named after typewriters. There is no government and even if they elect a president such as Bleeker, he can't do anything (Sounds familiar) and to move between the tribes invites huge risk. There is a longing to reconnect, but it is impossible and society has disintegrated into packs of craziness and utter brutality. Royal is cast out into the world to make his way, learning to sign to try and communicate with people who have lost the ability to use words and meets up with Old Boy, a grey before his time, who is found almost frozen to death on the ice. They are traveling the wire, what is left of civilisation towards the frozen north, carrying a frozen corpse. Old Boy says this is what they have to do. But why? And what of the others with them - such as Rabbit who is forced to run ahead to distract othersas they make their progress north. Jeff Hunt author of Edwardo Aquifer writes with cystal clear imagery and has imagined a terrfying future. This Kindle edition is a little ragged, but eminently readable and one definitely wants to know where this post-apocalyptic tale is heading.